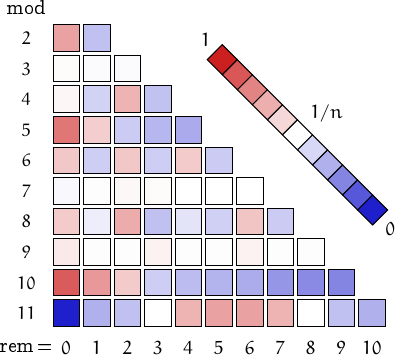 A number is a katadrome in a given base (often 10 or 16) if its digits are in strictly decreasing order in that base. For example, 43210, 76521 and 9630 are all katadromes in base 10. If we allow the digits of a katadrome to be non-strictly decreasing (i.e., nonincreasing, like in 43310 or 2222, we obtain nialpdromes. Similarly, the numbers whose digits are nondecreasing and strictly increasing are called plaindromes and metadromes, respectively. The total number katadromes in base is equal to , hence in base 10 there are katadromes, from 0 to 9876543210.
is the largest katadromic prime whose index is a katadromic too. 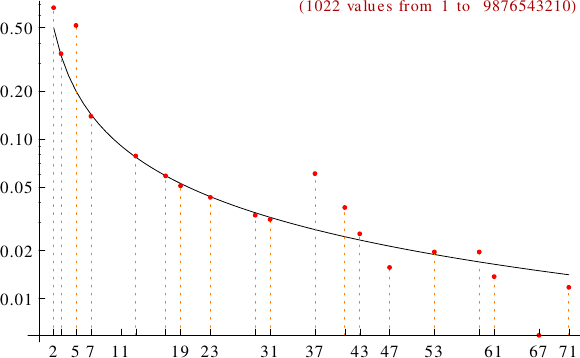 A graph displaying how many katadromes are multiples of the primes p from 2 to 71. In black the ideal line 1/p.